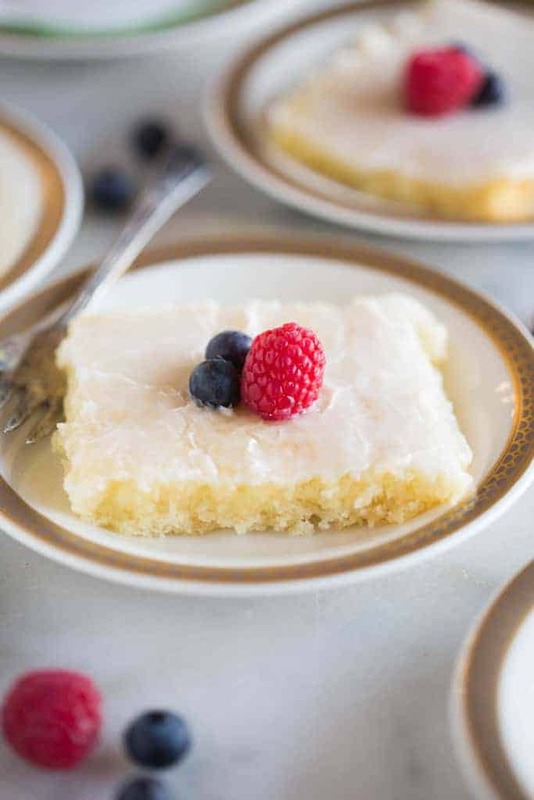 A delicious white sheet cake with a hint of almond flavor and a vanilla almond frosting. This amazing cake is one of my all-time favorites! 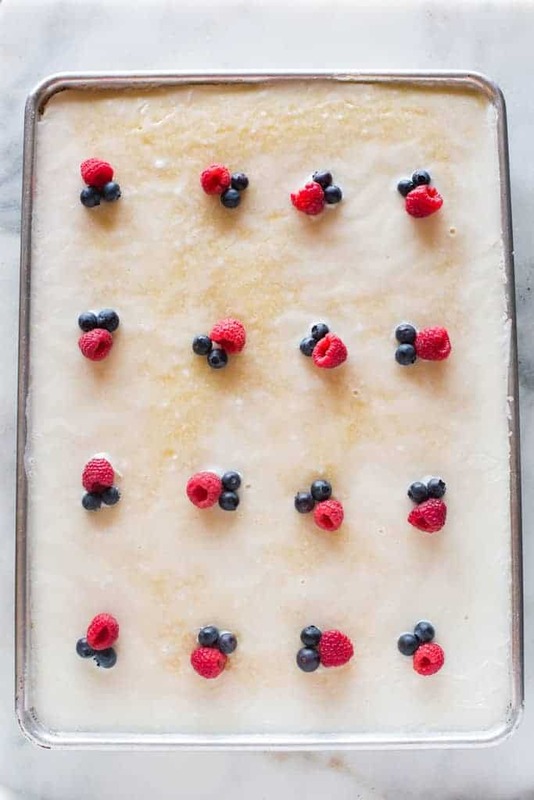 When it comes to sheet cake, I never thought a recipe could come as close to my favorite as my MIL’s awesome Texas Sheet Cake. 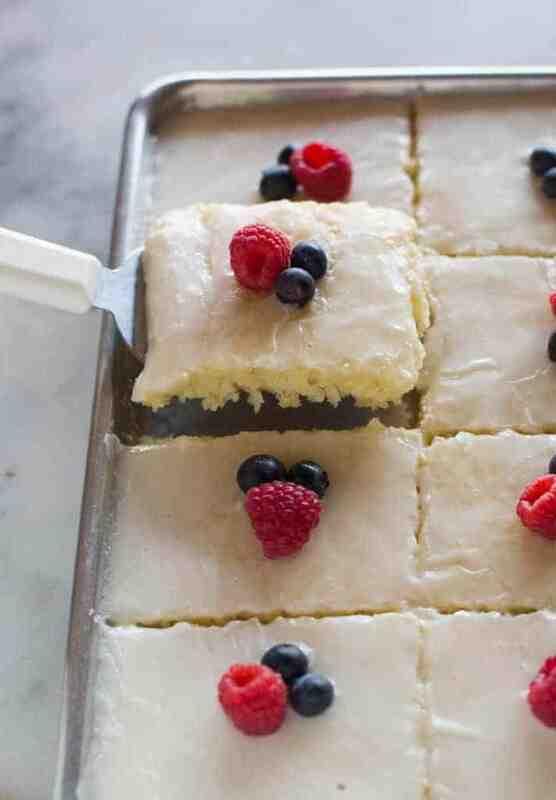 Then my Aunt gave me the genius idea to adapt that recipe into an almond sheet cake. This recipe is nearly identical to the chocolate one–I just left out the cocoa and replaced the vanilla extract with almond extract. The result is the most AMAZING sheet cake! The cake is very soft and moist cake with a hint of almond. I love the addition of fruit on top too, for a fun and beautiful twist. This cake is perfect for parties, since it feeds a lot of people and it’s really easy to transport. You can even make it a day or two ahead of time–just store it in the fridge. Start by mixing the dry ingredients together –flour, sugar, baking soda and salt. In another bow, mix the sour cream (I’ve substituted plain Greek yogurt many times with great results), eggs and vanilla extract. In a small saucepan, melt the butter and water and bring to a boil. Once boiling, remove from heat and stir into the batter. 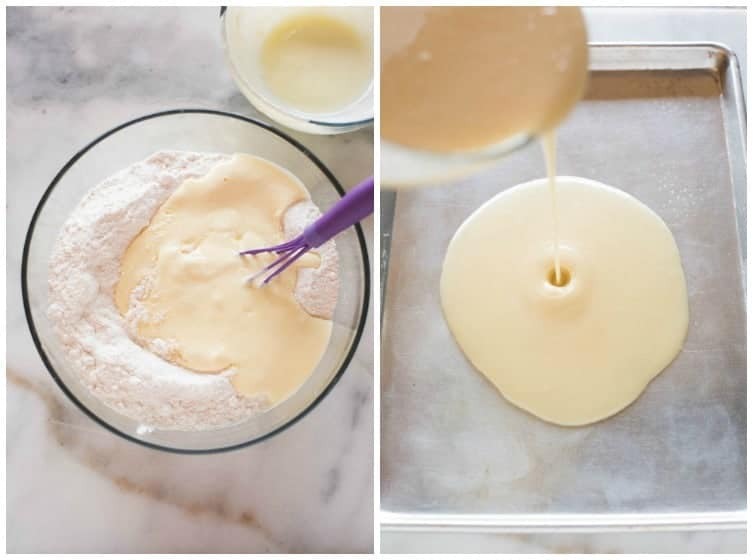 Pour the batter into a greased 15”x11′ jelly roll pan and bake for 17-20 minutes. When the cake is about 5 minutes away from being done, begin preparing the frosting, as directed. I just use the same saucepan that I already got dirty. Pour the warm frosting over the warm cake and use a spoon or spatula to very gently spread it evenly over the top of the cake. Top with berries. Allow to cool completely before serving. A little trick I’ve learned for cutting cakes like this is to use a plastic butter knife! For whatever reason, it glides easier and cut smoother, so that you don’t end up with that excess crumb and frosting on your knife as you “pull” it across the cake. I hope you’re family falls in love with this cake. It’s absolutely delicious, and it’s super easy to make and decorate. 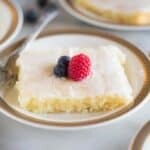 MY favorite almond cake is extra moist and delicious, with a hint of almond flavor and a vanilla almond frosting, with fresh berries. Preheat oven to 350 degrees F and grease a jelly roll pan (around 13x18'' or 15x11 will work well). Mix together the flour, sugar, baking soda and salt. In another small bowl mix together the sour cream, eggs and almond extract. Add sour cream/egg mixture to the flour mixture and mix just until combined. Add water and butter to a medium saucepan over medium heat. Bring mixture to a boil. Once the mixture is boiling, remove from heat and add to the batter, mixing to combine. Pour batter into prepared pan and smooth with a spatula into an even layer. Bake in preheated oven for 17-20 minutes or until a toothpick inserted comes out clean. When the cake is about 5 minutes away from being done cooking, prepare the frosting. 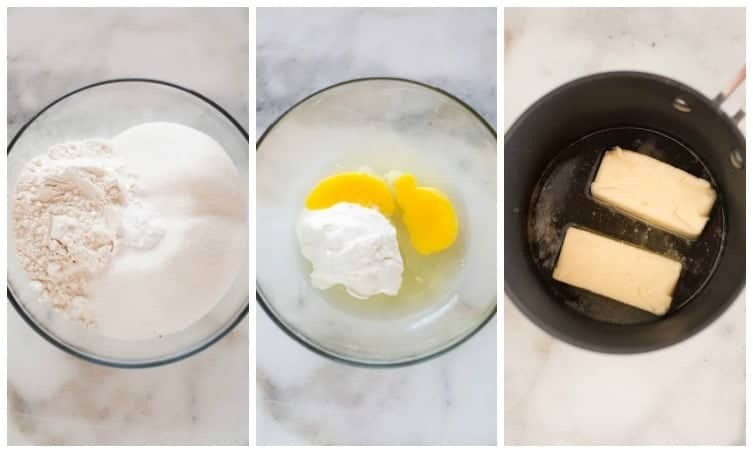 Add milk and butter to a saucepan. Bring mixture to a boil. Once boiling, remove from heat and stir in powdered sugar and almond extract. I like to beat the mixture with my hand-held mixer to get rid of any lumps. Pour warm icing over warm cake. Use a spatula to gently spread it evenly over the cake. Top with fresh berries, if desired. Allow cake to cool before serving. I originally shared this recipe May 2015. Updated January 2018. I am not sure I have ever had so many compliments on a bar! All of the ladies at church wanted the recipe! Amazingly delicious and wonderful texture! That’s so nice to hear. Thanks for coming back to comment! This is definitely a winner. I used plain Greek yogurt and it was a perfect cake, other than my oven or racks are not level, so the cake wasn’t either. It seemed even more moist and delicious after it sat a couple of days. This was a big hit at our luncheon. I actually doubled it and made in a half sheet pan to make a thicker cake. Everyone loved it and I have received requests to make again..I garnished with raspberries, blueberries and almond slices..looked fantastic! Making it again tonight!